Today I felt like painting roses. I did three but wiped one. Every time I think I've come up with a good approach for them, the next time I try it doesn't work. What I mean to say is - they're hard to paint! I love your rose. I have a half finished rose still sitting in the closet. I just got so frustrated with it I quit. I think I might try again, but do it monochromatic so that I don't have so much to think about. Do you think that will help? How long did it take you to paint this? Lovely, the color and the painting. I find roses difficult too, those and peonies. Carol, your colors are always so soft and warm, it's a remedy for my eyes! Every day I'm looking forward to see a new painting of yours, wonderful job! I agree with you, roses are a bit difficult to paint, more than other flowers I think!! 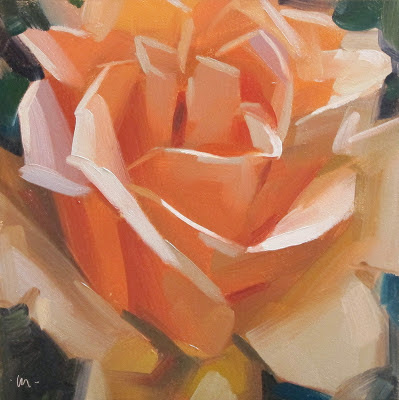 What a beautiful rose - there is such light in this painting! I love the way you focused on the top of the flower. Nice! 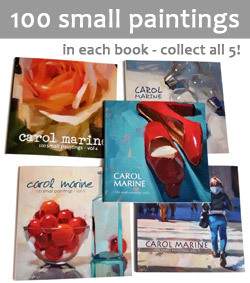 Just saw Professional Artist... Great showcase AND article. Had lost track of you after you moved and then I moved... in opposite directions. Will check to see what is open/wait-listed on East coast! I love the luminosity in this painting! I know how hard roses are to paint! Magnifique travail! j'aime ces couleurs pastelles. Beautiful! This is really a work of art. You really have the talent. Wow! How amazing! I guess this is what you called artistry. It looks so great. And I love how you play with the colors.